It's time to do something about the dearth of women in senior creative positions in advertising and marketing and the continued production of sexist ads and campaigns by some brands. Kathleen Griffith, Chloe Gottleib, Sophie Kelly, Madonna Badger, Sarah Watson. One of my most striking memories of the Cannes Festival of Creativity came two years ago while watching the inaugural Glass Lions being presented by jury chair Cindy Gallop. Billed as the "Lion for Change," the Glass Lions were set up to celebrate culture-shifting creativity. Entries need to demonstrate ideas that set out to positively impact ingrained gender inequality, imbalance, or injustice. They recognize work that implicitly or explicitly addresses issues of inequality or prejudice, through the conscious representation of gender in advertising. The first gold in the new category was awarded to Procter & Gamble’s #LikeAGirl campaign for its Always brand, which had already taken top honors at the PRWeek U.S. Awards just three months earlier. The problem is that, prior to the team from P&G, Leo Burnett, and MSLGroup walking up on stage to collect their gold, Gallop had shaken hands with a stream of male creatives claiming the awards for work that champions gender equality. It was almost laughable, and you could feel the discomfort in the auditorium as guy after guy snagged their Lion. If ever there was an indication of the gender imbalance in the advertising business, especially among creative directors, this was it in microcosm. Running parallel to this, there was increasing furor about the sexist nature of some of the work that won in other categories. Last year, Bayer particularly came under the spotlight for a bronze Lion-winning outdoor campaign for Aspirin produced in Brazil by Almap BBDO that critics said condoned the filming of sexual activity without consent. The work was subsequently removed from the festival and people such as Badger & Winters' Madonna Badger, who set up the #WomenNotObjects campaign to highlight the issue of sexism in advertising, called for Cannes to ban ads that objectify women. Several big companies including Unilever have vowed to drop sexist stereotypes from their ads and Cannes responded this February by teaming up with Badger to tell jurors not to recognize work that perpetuates gender bias. All jurors will be advised that: "Work that objectifies [and/or] perpetuates negative and harmful inequalities and gender bias hurts all of us." Cannes has also tried to address the dearth of senior female creatives in the industry through its See It Be It initiative, with its avowed aim to put high-potential senior creative women in the spotlight, expand their contacts, build their confidence, and accelerate their careers as leaders. The organizers put numbers on the gender imbalance in the advertising industry, saying that just one in four agency creatives are women, and only one in 10 will reach creative director level. Launched in 2014, the See It Be It program aims to change the ratio of female leaders in agency creative departments by choosing a select group of 15 women each year to take part in main stage seminars, get behind-the-scenes jury room access, mentoring from senior creatives and respected industry leaders, and fantastic networking opportunities. Most importantly, participants are encouraged to "send the elevator back down" and pass on the benefits of their experience as they progress in their careers and continue to advocate for industry gender equality. Cannes covers flights, accommodation, and a complimentary complete pass to the annual Festival of Creativity and the organization should be applauded for setting up this program, reacting to the sexist ad furor, and changing their entry guidelines accordingly. This Tuesday, I was lucky enough to attend a See It Be It event at ad agency BBH’s HQ in New York City, at which the program’s 2016 ambassador, BBH's global and NY chief strategy officer Sarah Watson, handed over the 2017 baton to Madonna Badger. A crowd of 150 female creatives listened intently and participated in a fantastic evening of reflection, inspiration, and debate about succeeding in advertising as a woman. 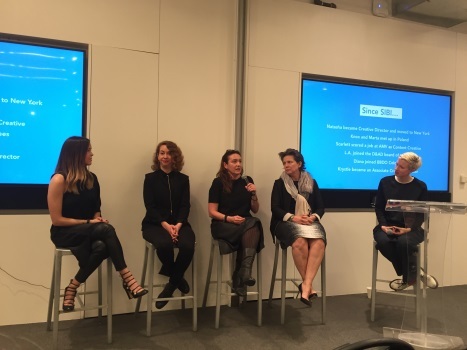 A panel discussion about confidence hosted by Watson revealed some incredible perspectives from Badger; R/GA executive creative director Chloe Gottleib; Grayce&Co founder and CEO Kathleen Griffith; and Sophie Kelly, SVP of North American whiskeys portfolio at Diageo. The audience also heard from three members of the 2016 See It Be It group, who were equally inspiring and more than proved the value of the initiative in one fell swoop. Through initiatives like this, mentors and cheerleaders such as Watson and Badger, and groups of See It Be It alumni spreading their stardust through the industry, I hope the shamefully small number of ECDs will soon be supplemented by many more smart and talented women. This will, in turn and by definition, lead to less tolerance of sexist attitudes that lead to offensive work such as the Bayer Aspirin ad. There is still time for women in the creative industries to make their case to be part of the 2017 See It Be It group (deadline is March 10) and it is open to PR people just as much as it is advertising folk, so why not give it a go for the chance to experience a career-changing week in Cannes that could change your life?